Akdeniz University, Business Administration Department, Turkey. *To whom correspondence should be addressed. E-mail: edaoruc@akdeniz.edu.tr. Received 29 March, 2017; Received in revised form 07 April, 2017; Accepted 12 April, 2017. Sustainability, Financial performance, BIST sustainability index. 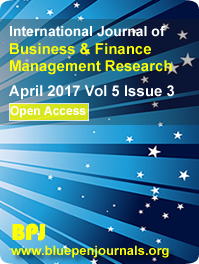 Sustainability reporting and analyses draw attention as a popular and vivid research area in business management and economics. In recent years, the numbers of reports published by companies in this area have been increasing rapidly. According to a survey of the world's largest 250 companies, approximately 80% of companies are preparing to have social, environmental and ethical reports. Although the corporate sustainability approach is imposing some additional costs on the companies in short run, it will provide significant advantages to the companies in the long run, which will make positive contributions to the companies operating within the frame of corporate sustainability in terms of financial performance such as profitability, efficiency and shareholder investments.